Sunscreen Prevents Aging and Skin Cancer, Maybe Not! Does Sunscreen Prevent Aging Of the Skin? There is no denying that using a sunscreen can slow the process of aging and of course spending too much time in the sun will definitely have the opposite effect, by accelerating it. So what we need to understand is that aging can be equated to many factors all of which can also include environmental pollutants and genetics. When applying sunscreen we always want to make sure that we use broad spectrum protection from UVA and UVB rays. This is something a mineral based sunscreen containing Zinc Oxide and Titanium Dioxide provide. However, there are many other types of synthetically created sunscreens some women are very happy with when used in combination with their mineral makeup products. The thing to remember though, is the skin will still age every time we go out into the sun and that our sunscreen use is not a license to spend more time in the sun, thinking because we have on sunscreen we can now throw caution to the wind. Also some studies have shown that certain types and combinations of these synthetic sunscreens can further produce free radical damage to the skin. So no matter what, we feel it is a best case scenario to always use a mineral based cream when you can find it and supplement with your mineral makeup foundation each and every day to maintain that broad spectrum protection. The EPA And the SCCS in the EU Final Research has shown that mineral based suncreens are safer for skin and protect better against free radical damage. Keeping an eye on the UV index for your state is also a great way to avoid certain time frames during the day for the least amount of sun exposure. But bottom line, nothing works better than avoiding sun during peak hours, using clothing, sun hats for fighting facial wrinkles, big sunglasses containing sun blocker lenses to slow the formation of eye wrinkles, and last but not least seek shade during peak sunlight hours. 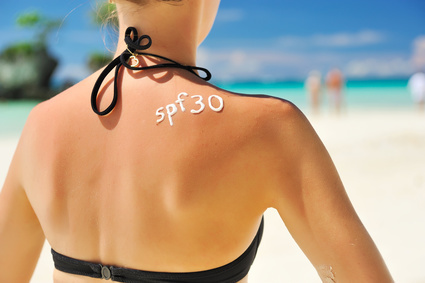 SPF factor is also a personal preference, but remember, no matter what number you choose, there is very little evidence of difference between SPF 30+ or something higher. It is still about reapplication for best protection since the body absorbs, sweats off and wears off your sunscreen as the day goes on making your SPF factor greatly diminished. Again another reason to supplement with your mineral foundation, since it helps to stay put all day until you wash it off. With all the evidence available and the ongoing bombardment about making sure we wear sunscreen whenever we go outside, then we have to wonder why are incidences of deadly Melanoma and other skin cancers on the rise? This is a question we have analyzed in great detail since some of us are literally covered in freckles and moles, so those folks have to pay particular attention to their skin and have annual checkups with a dermatologist. Katherine, personally has had cancers removed from her stomach, shoulder, back and face, with her first tiny melanoma being found on the stomach and her latest, more invasive one, being found on her shoulder. Again, early intervention made this mole cured by all observations, yet she has a 3 inch scar as a permanent reminder. Melanoma does not have to be a death sentence if we are privy to the slightest change to a mole or having one suddenly appear. Unfortunately, with the invention of sunscreen, many did have the idea that they would now be able to spend more time in the sun since they are wearing their "coating of armor" so to speak. The impact of this mindset is considerable with increased cases of different skin cancer continuing to rise. UV rays are radiation and no amount of sunscreen will prevent it's penetration into our DNA when we expose ourselves to it on a consistent basis, especially going outside unprotected. Does This Mean Applying Sunscreen Is A Waste Of Time? Not at all! We simply need to realize that protecting the skin with liquid sunscreen and mineral makeup will only slow the aging process, not prevent it. Plus, skin cancer is still a very real possibility from things we did to ourselves in our youth, up to not taking added precautions later in life, such as those that are suggested by the professionals. Sunscreen cannot be the only answer to guarding against aging and skin cancers. By knowing these basic facts and simplifying the parameters of what to expect from a sunscreen, we can now take that little extra step to improve on our sun habits, not forgetting that certain levels of sun does wonders for boosting our vitamin D levels. This in and of itself promotes body healing and prevents many other forms of cancers. It is all about perspective and finding the right balance as the dog days of summer come around every year. Have fun and choose wisely how you dress, what time of day you spend in the sun, and still always use a mineral based product for the ultimate in broad spectrum protection.